Coming Soon...my first mini comic! Since last fall, I've been working with Matt Silady to write and illustrate my first mini graphic novel! I'm excited to announce that the first book, titled simply "Jeff and Emily" is now for sale through Blurb. "The first book in a soon-to-be series about a dynamic duo. Humorous, heartwarming, and heartbreakingly relatable for anyone who has ever struggled with an “imaginary friend”..."
Paper. Paper. Paper. Paper. Paperpaperpaper. Paaaaper. Paaaaperrrr. Payyyperrrrrrr. Pa-ay-per. Puh-ayyyy-purrrrrr. Pay-per? Pay-purr? I’m sure all of us have had the experience of saying a word so many times aloud that it becomes completely unfamiliar and strange-sounding. Meaning falls away and the sounds roll around in your mouth with an exotic new flavor. For me, this is a simple example of a much more complicated idea explored by Kenya Hara in Ex-Formation. Hara combines the practices of design and communication with curiosity, wonder, and exploration as a way to facilitate the unknowing of the world. He quotes Socrates: “...the only true wisdom is in knowing that you know nothing.” Socrates also wrote that “wonder is the beginning of wisdom.” It seems to me that what Hara is suggesting is a method for restoring wonder to the world; a way of training yourself to see the world anew as a strategy for facilitating imagination and creativity. At first, Hara’s suggestion that we work to un-know something seems counterintuitive. Aren’t we supposed to do exactly the opposite when designing? Isn’t our job, as designers, to demystify the world? To create order and understanding? Perhaps. There’s no denying that, in many cases, this is a service we’re trained to provide. Conjuring clarity out of chaos is indeed a difficult task, requiring close attention, rational thinking, and creativity. Perhaps it’s more interesting, though, to create works that raise questions instead of serving up answers. Today’s world is obsessed with the instant, on-demand, 24/7, saturated consumption. There’s an answer for everything; a smooth solution. While this smoothness and immediacy can be valuable (and is valued at the highest level), I’m more interested in ideas that create friction. I’m interested in the idea that designers can use their skills as creatives to disrupt the status quo and bring a sense of magic to the mundane. It seems to me, in my limited life experience, that highly creative people are also highly curious and intelligent people. These individuals seem to have a knack for finding novel connections and seeing patterns invisible to most. They often talk about finding “inspiration” in ordinary moments; moments that became extraordinary when they applied their unique perception and refined lens for viewing the every day. I agree with Hara that we need to trade “I knows” for unknowing. I strongly believe that abounding curiosity is a sign of intelligence. Albert Einstein famously writes, “I have no special talents. I am only passionately curious.” Recent psychological studies, according to an article by Harvard Business Review, strongly link IQ with EQ (emotional quotient) and the newly-defined CQ (curiosity quotient). While IQ measures the raw horsepower of your brain, EQ measures interpersonal skills, and CQ reflects how “hungry” your mind is for new ideas and experiences. IQ is difficult to control, but EQ and CQ can be developed- and, some researchers say, are just as important as IQ in measuring overall intelligence. Taking a swim in the ocean of ambiguity leads to a greater capacity for complex thinking. Therefore, Hara’s challenge to begin unknowing the world is an exercise in developing our CQ. Those that pursue the unknown are called explorers or pioneers. What do we call those that reverse the process of knowing? How can we return to this way of seeing the world? How might we reveal the infinite number of potentialities that exist all around us? How can we ignite curiosity in banality? These are the questions I’m interested in pursuing. There’s a kind of raw excitement that we feel when we encounter something entirely new. How might we return to a state where we feel like we’re seeing the world for the first time? How might confusion and ambiguity be tools for success? It’s a matter of balance- of finding the sweet spot between intrigue and frustration. Fostering a low-level state of confusion could be a way of engaging play and recapturing the mystery and wonder of the unknown. Saying it is simple, but creating work that embodies this “sweet spot,” or even producing examples of it, is much more difficult. Curiosity should not be confused with cheap novelty- a cigarette lighter that looks like a pistol is not leveraging the wonder of the unknown. It’s kitsch. Kitsch has its place, too, in our world and can be leveraged for social critique. However, kitsch does not create wonder. It can only, at its best, foster surprising juxtapositions of form and function grounded in a specific culture. Instead of creating kitsch, how do we create work that targets a different kind of unexpectedness; one that leverages our natural human curiosity toward the Great Unknown? How might we imagine an entirely new possibility? Is it still probable, in today’s hyperconnected, infinitely complex, “I know” age, to dwell in ambiguity and the indiscreet? It’s a game of manipulating known material, context, and form to create something that makes your viewer stop and think “what is that?” and, perhaps more importantly, motivate them to investigate. Simply looking at something as if you’ve never seen it before- slowing down, noticing details of how an object looks, feels, functions and relates to other things in the world can produce surprising results. Charles Darwin, writes in The Origin of the Species, “There is grandeur in this view of life, with its several powers, having been originally breathed into a few forms or into one; and that, whilst this planet has gone cycling on according to the fixed law of gravity, from so simple a beginning endless forms most beautiful and most wonderful have been, and are being, evolved.” Darwin was a master of slow observation, as proven by the famous Galapagos Finches or his prediction of the existence of X. morganii praedicta (a species of moth with an absurdly long tongue). Dwelling in wonder can open new whole worlds of thought. “Knowledge is merely the entrance to thought,” writes Hara, “...to know things is where imagination starts.” Observation gives us knowledge, but leveraging that knowledge for true imaginative thinking is another thing entirely. One can know many things. However, it takes a curious mind, open to ambiguity and unafraid of absurdity, to make unexpected connections between the things that are known to uncover the unknown. Hara call us to have the courage to be uncertain, to admit that we do not know as a strategy for design. After exploring a larger part of the city, I created a personal psychogeography of the area around CCA's campus. The map highlights areas of entrance and exit (largely dictated by the infrastructure of the city's public transit system), emotionally charged locations, the boundaries of the known. As a young woman, navigating a city alone can pose its own set of challenges- there are areas that feel "safe" and areas that are deliberately avoided or traversed with caution. What about these places makes me feel like I can't go there? How can we make our cities feel safe for everyone? Recently, for a class assignment, a group of my friends and I got together to go on a derive! Our group’s derive started in Dolores Park on a sunny weekend morning. We let the sidewalk lead us up into the park, a wide path that beckons toward the open, grassy spaces in the park. We followed the meandering paths past benches and a tennis court before the sound of a drum line practice at the nearby school caught our attention. We let the sound lead us out of the park and back onto the busy main streets. While the park had a lazy, relaxed feeling, the streets nearby felt much more harsh and hostile, and we soon escaped down a quieter residential street to slow our pace again. It was still unclear to all of us what we wanted to explore, but something particular caught my eye. I became very interested in the color and texture juxtapositions created by the natural world interacting with the built environment and the residue of the human. This “residue” might be a sprinkler head in a patch of grass, a poster caught up in the branches of a tree, an orange peel dropped on the sidewalk, or a name carved in concrete. Different areas of the city have different kinds of residue. The main streets are often filled with bits of trash with harsh graphic logos and colors still screaming for attention. The park felt more serene- as if people were more reluctant to disturb the built environment. Or, perhaps, the city is simply quicker to erase the residue in these zones. However, I found the residential areas the most interesting. We spent quite a lot of time in the residential streets. The cool shade and calm quiet naturally slowed our pace and invited us to look more closely, to take our time. People find a way to mark their spaces in a myriad of ways. Many homes have names and pictures written in the concrete outside their doorsteps. Others have hand-lettered “NO PARKING” notices or notes for their local delivery person taped to their doors. These marks feel much more organic and personal; a sharp contrast to the graphics of the main streets. These marks felt like individual voices whispering, rather than the residue of a faceless company. This exhibition showcases work from the 2016 MFA Graphic Design Topic Studio Debranding and Post-Identity Design. 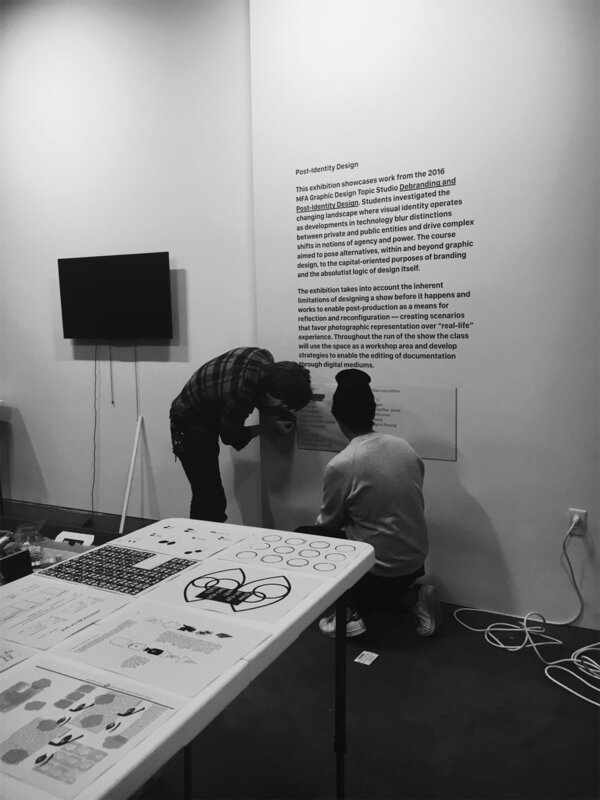 Students investigated the changing landscape where visual identity operates as developments in technology blur distinctions between private and public entities and drive complex shifts in notions of agency and power. The course aimed to pose alternatives, within and beyond graphic design, to the capital-oriented purposes of branding and the absolutist logic of design itself. The exhibition takes into account the inherent limitations of designing a show before it happens and works to enable post-production as a means for reflection and reconfiguration — creating scenarios that favor photographic representation over “real-life” experience. Throughout the run of the show the class will use the space as a workshop area and develop strategies to enable the editing of documentation through digital mediums. 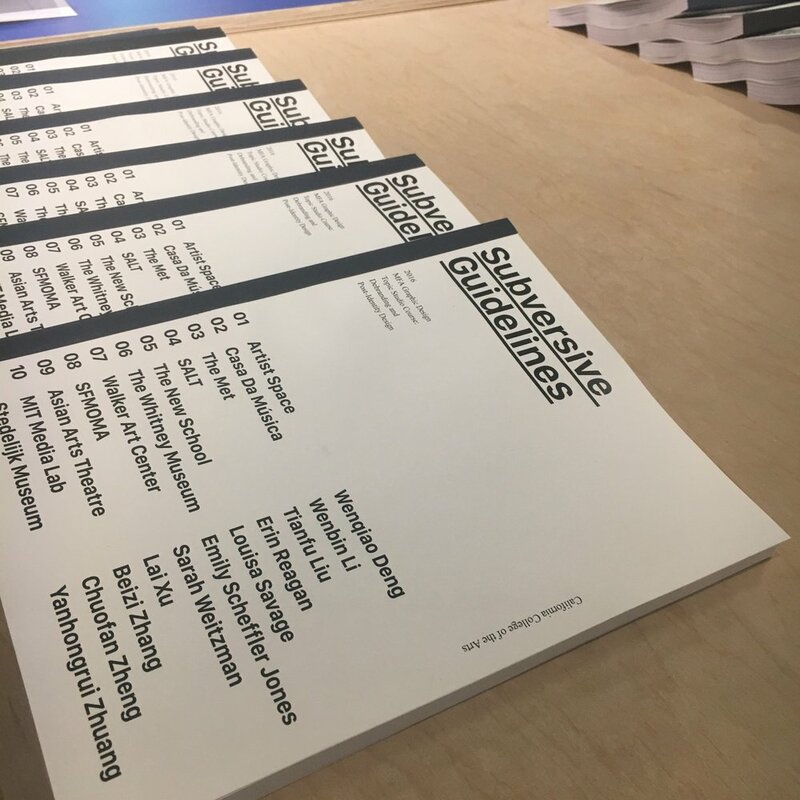 Subversive Guidelines focuses on contemporary identities for cultural institutions. The project highlights the limitations of identity design even within progressive approaches. New Territories focuses on the relationship between digital and physical spaces. Using identity design as a means of investigation, students reconsidered traditional ideas of borders and governance. Post-Truth Machines focuses on the fabrication and manipulation of reality through visual language. Each symbol on display was created and distributed through automated means in order to validate fictions and challenge misinformation. As a part of the "10 Second Works" exhibition at San Francisco Art Institute, Emily collaborated with artist and writer Hailey Scheffler to create a series of artworks produced in ten seconds or less. The resulting images and texts were an experiemental exploration in control, chaos, and composition. What happens when we dream? How might we explore, test, and harness our unconscious? In 2016, Emily participated in a workshop led by designer Federico Pérez Villoro in which she prototyped a speculative machine titled the "Passive Presence Manifestation Device," investigating the nature of internet-facilitated friendships that cross time zones. The creation of the machine was inspired by a dream in which she is passively watching Netflix with a friend and aims to explore what friendship, presence, and bonds mean in the age of the internet. The following video and flyer document her dream and her experience of coexisting with her machine for 24 hours. How would you design your death? Everyday, designers are challenged to create new solutions...even uncomfortable ones. Emily's research into designing for death led her to design a humourous manual for her loved ones for dealing with her swiftly rotting corpse. In the video below, Emily presents her manual as a part of the Re:Imagine End of Life event at California College of the Arts. Unlucky disaster or happy accident? This experimental poster series for a lecture by Federico Pérez Villoro takes advantages of the abilities and limitations of laser printing. It's been an amazing week and a half so far working with Stitch Fix! I have to admit, I'm feeling pretty pampered! Not only is the design team a fantastic group of people, but they keep the coffee coming, the view from their downtown office is killer, AND they took me on a trip to the SF MOMA! I'm working with their design team to develop email campaigns, and I'm loving their clean, sophisticated style! Their welcoming atmosphere and laughter-filled group lunches keep everyone inspired and the team working seamlessly. I am impressed and inspired by the talent and skill I see every day in their work. Check them out at www.stitchfix.com ! I've finished my time at Stitch Fix, and I must say, it was a wonderful experience. Their design team is top-notch, and I will sincerely miss working with them. The Stitch Fix design team is incredibly welcoming and supportive, but they also challenge each member to produce their best work for the optimal client experience. I have learned so much in just a few short weeks, and I hope to continue to keep in touch with the friends I have made. Oakland A's and SF Giants Magazines! Over the past few months, we've been working with Diablo Publishing on the layouts for the SF Giants and Oakland A's magazines! Here are some highlights of the features designed by Andy so far! We'll keep you updated! 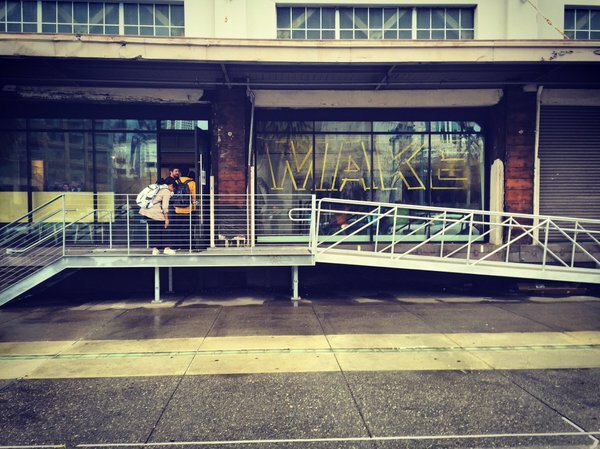 Emily spent a day at IDEO’s San Francisco studio for an action-packed, high-energy dive into the IDEO design-thinking process. Expert facilitators will matched me with a talented and diverse team of peers, and together we designed venture concepts that explore questions about what the future might look like. Like a hackathon, a make-a-thon is a fun and intense event where people build awesome things, but the tools they use go beyond code and skills other than software development are highly valued too. Our team, comprised of an entrepreneur, business student, web developer, orthopedic researcher, and graphic designer (me!) spent the whole day exploring how the blockchain (and nanobots!) could help improve lives!